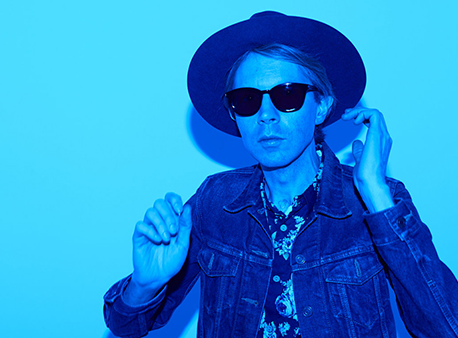 Beck announced tour dates this summer in support of his 12th studio album, 'Morning Phase'. I was pleasantly surprised to see Cleveland on the list, but not excited to see he is playing the State Theatre, which is a venue normally used for plays in Cleveland's theater district, Playhouse Square. This shows Beck's approach in his tour dates will be driven around the slow, easy-going pace of 'Morning Phase'. I am pumped regardless. I just hope he plays some of the classics. Tickets pre-sale start tomorrow at 10am local time using the password MORNING. He also announced on his website he'll be on The Tonight Show starring Jimmy Fallon on Wednesday, 3/12. The New Zealand indie pop rockers visited Cleveland's House of Blue Monday night. They are touring in support of their latest album In Rolling Waves (2013). I walked up and got a ticket at the box office because the show wasn't even near being sold out. The venue looked fairly bare, especially upstairs where the balcony lounge area was nearly empty. The crowd was filled with wannabe hipsters and the other half with late 30s/early 40s housewives with their miserable husbands who were pissed because they were out on a weeknight. I pushed down to the lower GA area, and leaned up against the back rail. Let me first say that I'm pretty Italian and I don't mix well with bagpipes. However, we went out for my cousin's birthday on Saturday night to see Gaelic Storm at the House of Blues in downtown Cleveland because I love my cousin and it's always a blast going out with her and her fiancé, a full blown Irishman. The night started with beers and Jameson over there place (I didn't partake in the Jameson...wouldn't have lasted through the night). We got to the House of Blues pretty tuned up and walked into a crowd with the similar frame of mind. 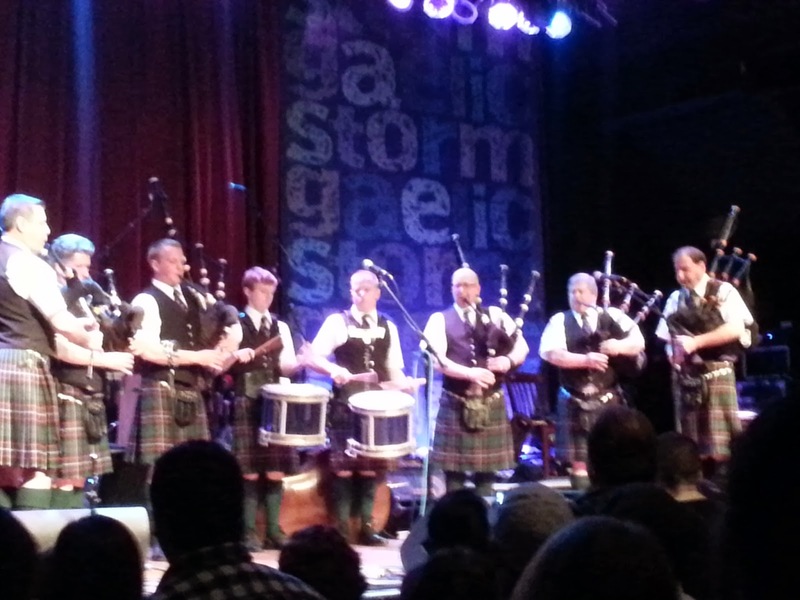 The first opener was a group of traditional bagpipe playing, kilt wearing gentlemen. Pretty cool, even though like I said bagpipes give me a headache. They rattled through several classic tunes and marched out to a pumped up crowd. 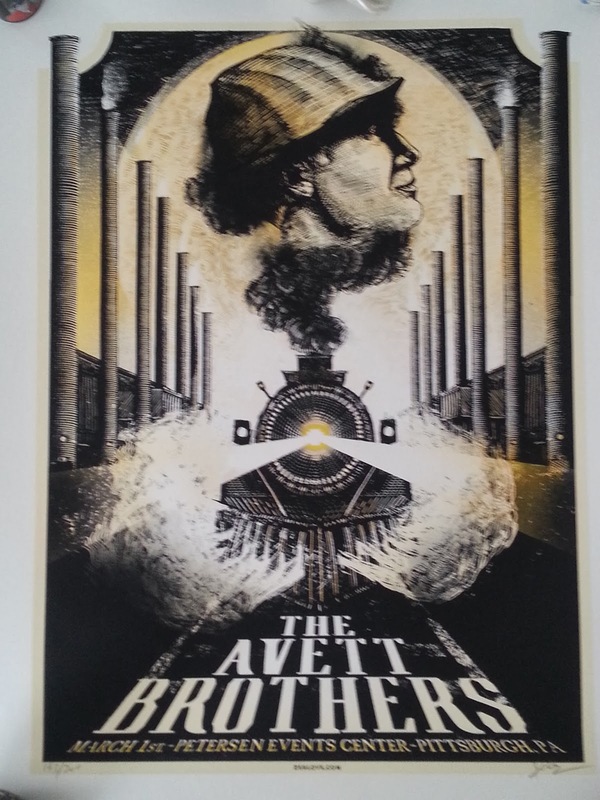 Last week I posted a review of the Avett Brothers concert we went to last weekend in Pittsburgh. It was an awesome show, as it usually is with the Avett Brothers. What I left out was the gig poster for the show sold out before the intermission between Old Crow Medicine show and the Avetts. I was pretty bummed, but luckily I researched a bit this past week and found out the artist, Zeb Love was selling 50 more from the show on zeblove.com. I purchased it immediately and got it in the mail yesterday. Its a such solid poster.